I've always preferred the feel of a controller in my hands to a mouse and keyboard. I go so far as to connect my Dualshock to my PC for much of my PC gaming. I know I'm giving away a competitive edge, but I like what I like; and besides, the vast majority of my FPS and action type gaming is done on console anyway. While I'm happy to click away in a strategy, card, or 4x game; I just won't be getting enough practice on PC to warrant the investment. And then GameSir came along with the VX AimSwitch telling me I could mouse and keyboard on my PS4, and they had my attention. Is it possible I could not only get good with mouse and keyboard but have that pay off everywhere in my gaming life? Now this isn't the only way, or even the first way, to get a mouse and keyboard working for PS4. The PS4 can natively connect to a bluetooth or wired keyboard and mouse combo. There is even one official mouse and gaming keyboard of the PS4, the Tactical Assault Commander Pro by HORI. Problem is there are only a handful of games set up to register the keyboard input. Games like DC Universe Online, Elder Scrolls Online, Final Fantasy XIV, or Fortnite. Alternatively, there are also already products out there like IOGEAR's Keymander or the Xim4 that act as a middleman and offer you a USB for your favorite combo and then will translate the commands from them into those of a controller. GameSir are however the first, to my knowledge, to be packaging not just an adapter, but a keyboard/mouse combo directly in to that adapter. Opening the precision of the PC on the PS4. Oh, it also works for Switch, Xbox One, and PC as well. Now I don't have a Switch to try it out on, and Xbox has already announced support for mouse and keyboard months ago with Razer coming in with specifically branded products and similarly short list of compatible games to Sony's. So for this review I will really only be testing on PC and PS4. GameSir, with their VX AimSwitch is tying the whole package together. Adapting inputs to all consoles while providing the hardware to game on in a single package. Before we take a look at what comes out of the box, it's worth noting the box is a little basic. I'm not going to fault anyone on fluff like packaging if the final product is of suitable build quality, but the packaging itself felt like corners were cut. 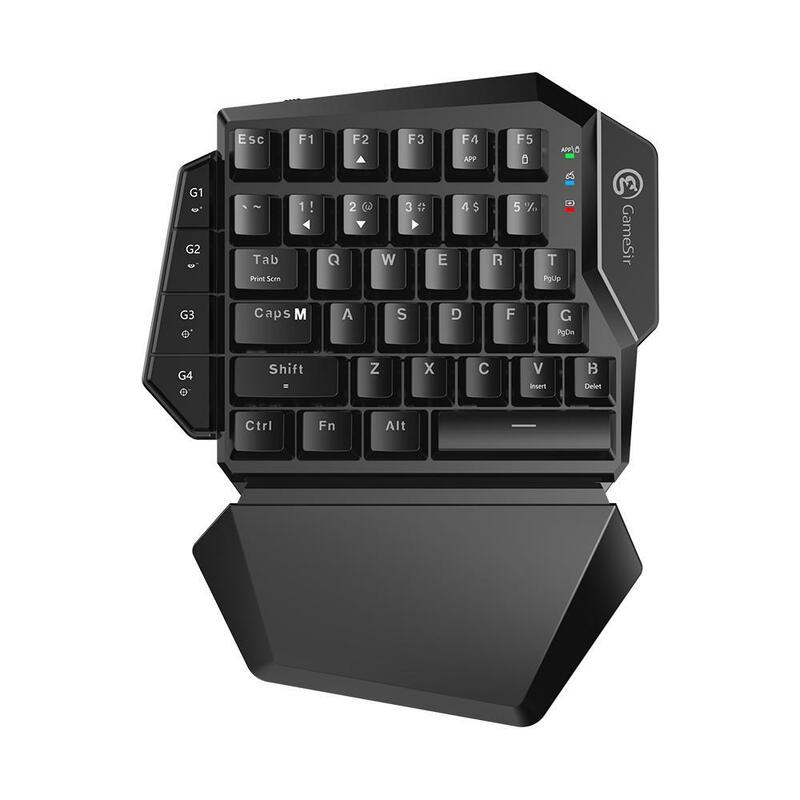 The main unit, the half keyboard that actually makes the wireless connection to the console dongle is very sturdy. I was quite impressed. 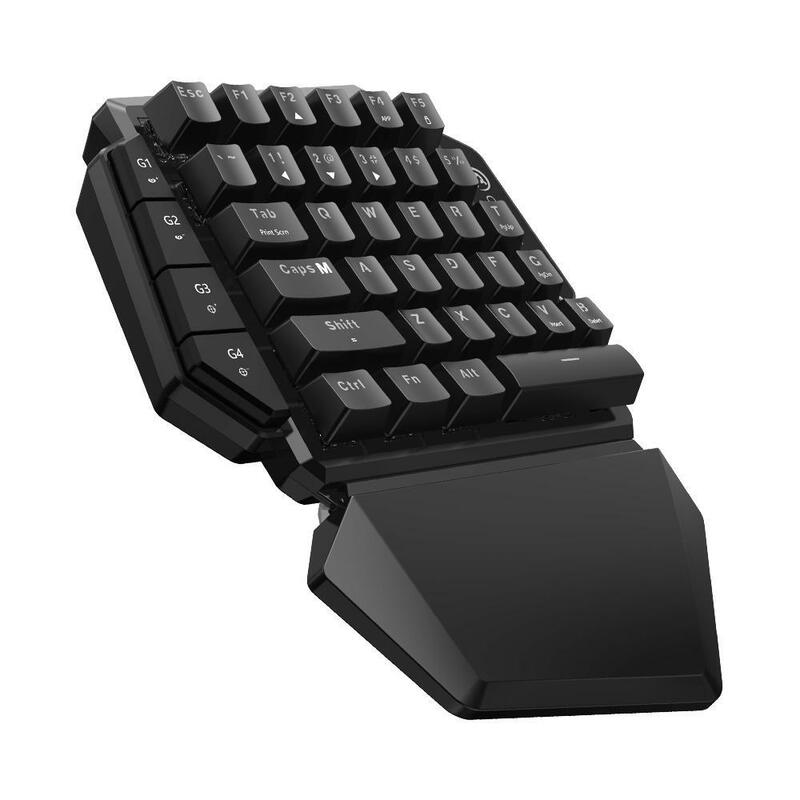 It boasts the steady bump and click of mechanical blue switches, grips well, and is very comfortable for a keyboard. The only thing it seemed to really be missing was any LED backlighting, which was actually quite shocking, given that the included mouse, a far inferior product, did have it. Blue LED backlighting with a braided cord and responsive buttons were all nice touches but highlight an extremely light and plastic-y feeling mouse. It just feels a little cheap. Thankfully, it is easily replaced. 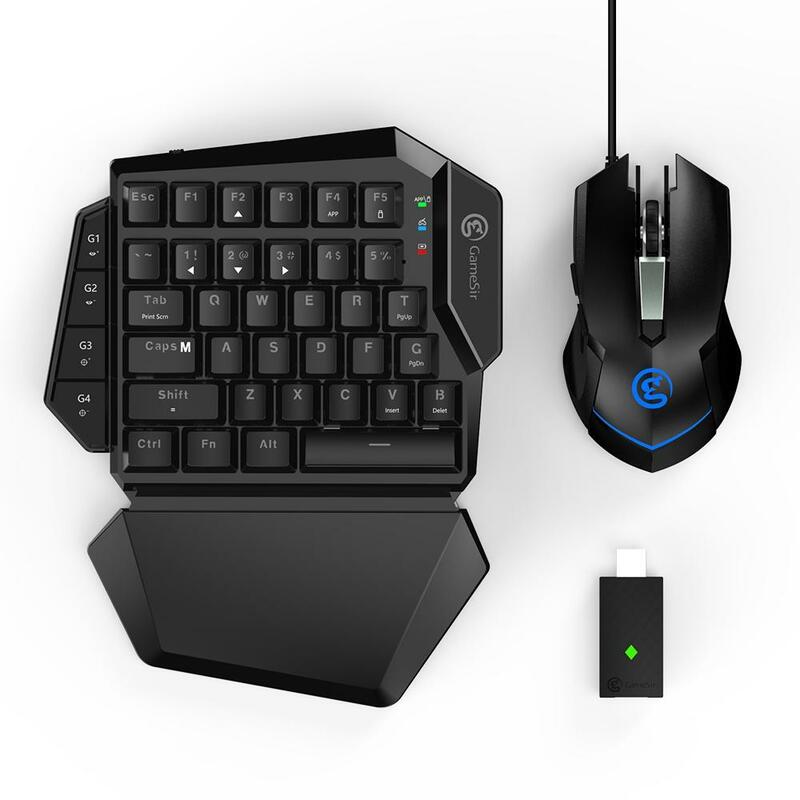 As the much more impressive keyboard holds all the connection goodies you can freely swap out the mouse with any of your choosing. Set up is as easy as can be. Just plug into PC either through the included USB dongle via wireless sync, or using the provided micro-USB charging cable for a wired connection. Playing on PC is flawless. It's a sturdy, reactive half keyboard. 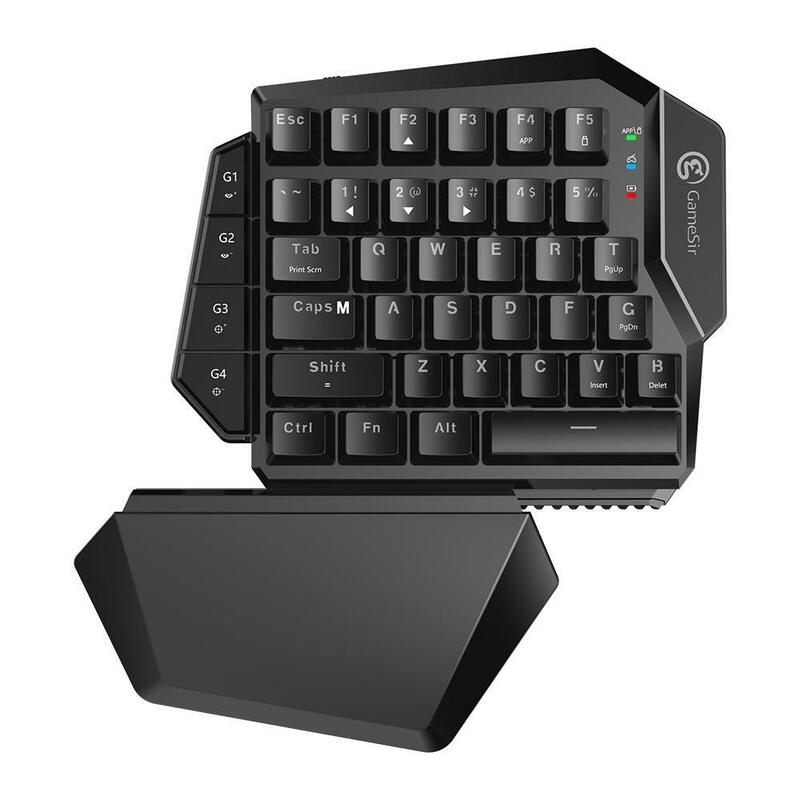 It's compact and portable enough to toss anywhere around the desk into an optimally comfortable position and has enough keys to handle whatever games I threw at it. Setting up with PS4 was also easy, it only required one additional step of also plugging a Dualshock controller into the back end of the wireless USB dongle. This seemed to be a critical component, as without a native controller plugged in to the dongle the unit stopped functioning entirely. But the gameplay wasn't nearly as seamless as with PC. God of War, or any game that relies on R1/R2 combos instead of the L2/R2 combo of aim and fire in FPS games suffer from burying that R1 button along the thumb line entirely too close to L1. Also God of War, or any game requiring nuanced analog input from the left thumbtack is going to suffer as WASD style controllers are digital, on or off without gradients. In Tetris Effect, I was basically playing one handed as every pertinent control was now mapped exclusively to my left hand. Stellaris: Console was funny because even thought it was a PC port and I figured this would be a keyboard and mouse slam dunk, it had been so optimized for Console it practically dropped cursor functionality entirely. A game where it really should have stood out, it became more cumbersome because of again calling on my left hand to do too much while my right sat idle. Basically what it comes down to is this: on a controller, each hand gets mapped to two shoulder buttons and an analog stick that includes a third center click. Your left thumb also runs the d-pad while your right thumb gets four more buttons. However when you switch to mouse and keyboard, the lack of any analog input for the left thumbstick can be a showstopper, and there is simply too many other commands getting mapped to your left hand while your right is often idle only controlling the aim and shoulder buttons but foregoing all four thumb buttons. On top of that, despite this increased workload on the right, there are still no console specific markings anywhere on the keyboard to denote the default scheme. Trying to consistently remember and hit triangle circle and square was basically just a mini-game of roulette unto itself. In addition, I noticed some terrible input lag on the Division 2, and while firing my guns I couldn't even get my reticle back down after the initial kick of the machine gun. I also had trouble tracking enemies on flanking maneuvers. While the input combo is optimized for quick target acquisition, following events across a 360 degree field of view can be a real chore. In other games, like Anthem, I had no problems running and aiming. But then ran into a problem trying to initiate flight as I had totally forgotten how to find L3 and when I finally did find it on the keyboard it was much less fluid contorting my fingers to all the commands from the controller's dominance of maneuvering freely and then just clicking down when it was time to take flight. Then there were the personal annoyances like having the set every game's y-axis back to not being inverted any longer. While I need an inverted y for a controller the mouse warrants the opposite setting, which make me once again have to take up my torch and bellow: "it's freaking 2019 why on earth can't we make the y-axis invert a global console setting!" It's the single largest point of tedium in my gaming life a the moment, having to hunt down the settings first time I load up any new game and flip that switch. The end result is that getting the VX AimSwitch to really work isn't as plug and play as the setup. Inputs need to be mapped, settings adjusted, learning curves need to be, well, curved. If there is a competitive edge to be gained that isn't offset by an input lag, then it is one that will have to be earned. You can get more information on the VX AimSwitch at GameSir's website. The GameSir VA AimSwitch is a neat little product. It functions very well on the PC, even if you may want to swap out the included mouse for something a little more robust. It functions on the PS4 (and though untested presumably similarly so on Switch and Xbox One), but not nearly so well. 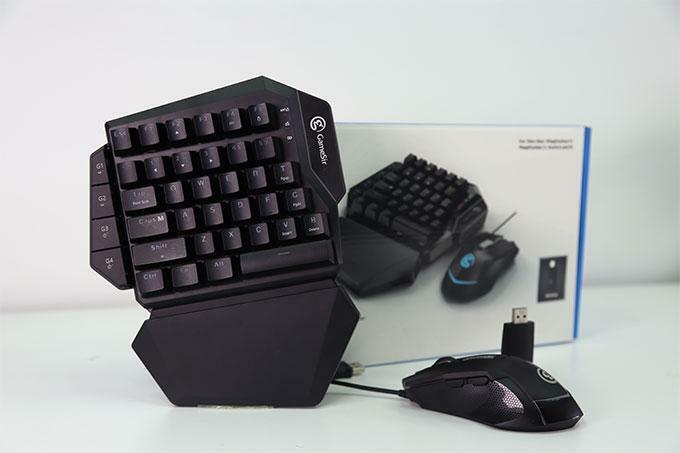 It does what it says, it connects a mouse and keyboard to a console. But you will need to invest time in customizing the inputs and then commit those customizations to memory as the lack of backlighting is going to hinder any discovery on the fly. Give me a left analog stick and customizable backlighting for my customized mappings and I'd be ready to boost this score into the stratosphere. Can you imagine how awesome this thing could look and function if I could not only select my triangle, circle, square, and x inputs but also backlight those selections with the corresponding green, red, pink, and blue of the buttons? In all, I don't think this product is quite there yet. It stands bravely in a niche and may have niche uses, but for PC there are simply better half keyboard options out there that already include an analog stick and at lower price points. And for console, well for now, I'm just going back to my controller.